Yes, Your Grout Choices Do Matter! As you work on your bathroom or kitchen tile renovation project, you are probably pretty concerned about which tile will go best with your cabinets and paint. While choosing the correct tile is an important factor in your project, the grout can be just as important to consider. 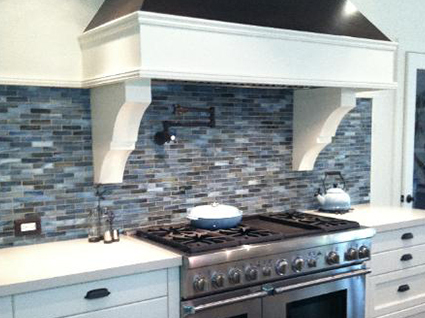 Many tile installation projects, such as your installing backsplash tile, are pretty similar in terms of procedure. A contractor will apply mortar to the work space and then place the tile on that. Once that has dried in place, grout will be applied to seal the surface. Grout is a cement-like mixture that comes in a variety of colors and textures. There are sanded varieties that are ideal for indoor spaces and have a smoother finish, while non-sanded varieties tend to have a courser texture. Grout can also have additives such as silica, polymers, and even latex to enhance the texture and usability. The first question you have to ask when choosing your grout is where will this be used? Indoor uses such as kitchen tile or bathroom tile will need a finer, smoother finish. Look for grout with additives to achieve this. The second question you need to ask is what type of tile and color are you choosing? Because choosing the right tile is a large decision, you need to be able to pick a grout that compliments your tile. Picking just a straight white grout can cause difficulties in cleaning and is a lazy way to go about your home improvement project. If you’ve picked a warm tile, there are many tinted options to provide additional warmth to the room. Or perhaps you’ve chosen a very light tile that needs a darker grout to compliment the room and not overwhelm it with brightness. Choosing your grout is just as important as choosing your tile. Contact us at Transworld Tile for suggestions on tile for your project and to discuss the appropriate grout option as well.